All for the same great price! 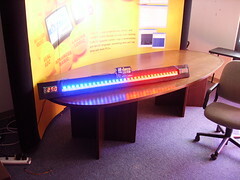 The ShiftBrite is a high-brightness LED module containing red, green, and blue elements. It uses a simple clocked serial interface to receive a 10-bit brightness value for each color, resulting in over a billion possible colors. Each input is buffered and output on the other side of the module. This allows each ShiftBrite to repeat the signal to the next, allowing longer cable runs between elements without excessive loading of microcontroller I/O pins. The six input and six output pins are 0.1" headers spaced 0.6 inches apart, allowing a ShiftBrite to fit on a breadboard or wide DIP IC socket for testing. ShiftBrite elements feature current control and automatic overtemperature control (an overheating channel driver will shut off until it has cooled). Each channel can also be adjusted with a separate current control register, for fine tuning of each LED if close brightness matching is necessary. The integrated voltage regulator powers the internal logic, allowing a single 5.5 to 9 volt supply rail to power the ShiftBrite chain. ShiftBrites can be easily controlled by using an Arduino microcontroller. 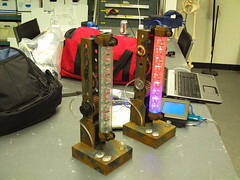 The ShiftBrite Shield allows a chain of ShiftBrites to be quickly connected to an Arduino with 6-conductor cables. The Shifty VU Shield is similar, but also includes an audio input and filter to easily build audio reactive LED projects. blinkenwall from Overflo from Metalab.at on Vimeo. Blinkentunnel Beta from Overflo from Metalab.at on Vimeo.